A few weeks ago I watched this show on The Cooking Channel called Pizza Outside the Box. This show featured fun and different pizzas from around the country. One of the pizzas that I totally wanted to try came from North Carolina. It was a Buffalo Chicken Pizza, and it actually came from a food truck. It seemed really simple to make, and who doesn't love Buffalo Chicken! I ended up making a personal sized pizza last week just so I could try it out, and it was very tastey. **Please note that I am not including exact measurements because it will vary depending on the size of pizza you are making. Spray or brush some olive oil onto the crust. Then pour some pizza sauce into a bowl and mix about 1 tablespoon (or more if you like it hot) of buffalo hot sauce in with the pizza sauce. I used 1 tablespoon for a personal pizza size. You may want to use 2 or 3 tablespoons if you are making a larger pizza. Start with 1 tablespoon and then taste it to see if you want to add more. I would just add a little bit at a time. Spread the pizza sauce on the pizza and then cover with mozzarella cheese. I then browned some chicken in a pan over medium heat. You want to pretty much cook the chicken all the way through. At the very end I mixed 1 teaspoon of buffalo hot sauce in with the chicken just to coat it. Again, if you are making a larger pizza you may want to add more. Then add the chicken to the top of the pizza and bake according to your pizza crust's directions. I didn't make mine too spicy, but you can always make it more or less hot depending on how you can handle the heat! The buffalo sauce was a perfect combination with the pizza sauce and the mozzarella cheese helped to bring down the heat a little. Very delish!! Oh yum! Buffalo chicken anything is perfect in my book! 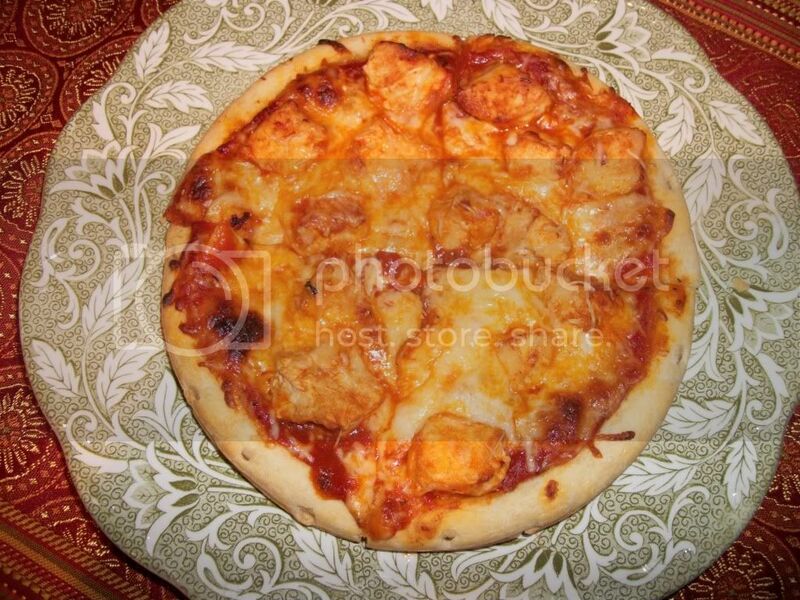 My husband has made buffalo chicken pizza, too, and it's another one of my faves, along with the mole pizza.